Stephen Hawking is without a doubt one of the most iconic figures of the twentieth century and beyond.The cruel juxtaposition of one of the most brilliant minds the world has ever seen combined with the tragic circumstances of his health from such an early age meant that it was only a matter of time before a large scale biopic graced the big screen. Upon seeing the initial trailer for The Theory Of Everything, I realised that beyond his health concerns, instantly recognisable computerised voice and famous scientific discoveries, I knew very little about Stephen Hawking the man as opposed to Stephen Hawking the icon. I was hoping that this new biopic would give me an insight in to the bittersweet world of one of our most famous and recognisable personalities. And in all the ways that you would expect of a solid life story, it does deliver. The Theory Of Everything takes the audience on a journey spanning decades from Hawking’s (played by Eddie Redmayne) initial motor neurone disease diagnosis aged 21 in 1963 through to his being awarded a Companion of Honour by the Queen aged 47. We get to see a number of crowning moments in his professional career, including the awarding of his PhD, his ground breaking theoretical work in the fields of time and black holes, and the publishing of his best selling book A Brief History Of Time. Interspersed throughout these achievements, of course, are the defining moments of his failing body, including the first acceptance and use of a wheel chair, his voice stealing tracheotomy and his introduction to the electronic voice software that we all recognise to this day. 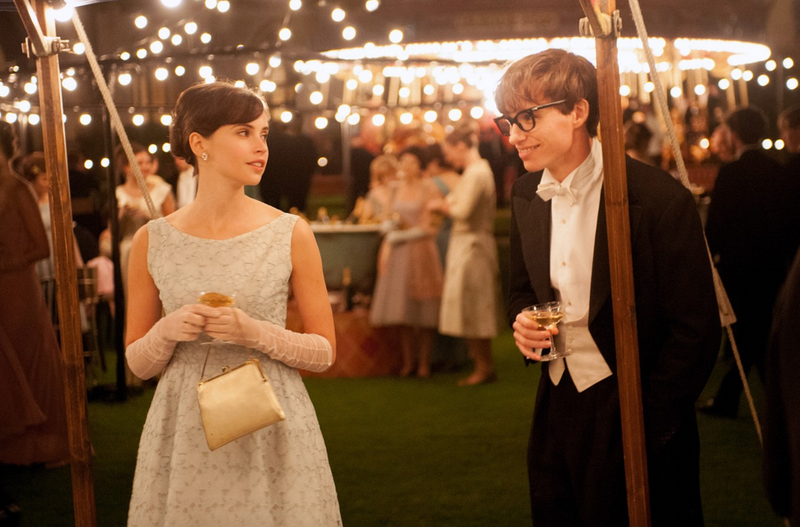 Encompassing and weaving together all of these separate plot points, though, is the over arching story at the heart of the film, the love story between Hawking and his first wife Jane Wilde (played by Felicity Jones). Taking inspiration from Wilde’s memoir Travelling To Infinity: My Life With Stephen, the main thread of the picture follows the couple’s early courtship, marriage and eventual separation, and the choice to centre a film about one of the world’s most prolific scientists on love really helps to draw a much wider audience in than if the narrative had been solely focused on dry science. In fact, Hawking’s personal life holds just as much interest as both his health and work, and the filmmakers have achieved a very pleasing balance between the three that creates a satisfyingly round portrait of a life that up until now had arguably only been recognised for one aspect. As a whole, words like satisfying and interesting are precisely the sort of adjectives to use when assessing the film overall. In terms of wide scale cinematic achievement, The Theory Of Everything plays very safe and remains within the comfortable guidelines of a classic British biopic, and whilst the minimal taking of risks services this particular story in a enjoyable manner regardless, the rather straightforward, stereotypical feel of the narrative construction could lead to the film being accused by some of a lack of ambition. It is an absolute certainty that the one element of The Theory Of Everything that elevates the film to higher level than it’s safe construction deserves is the outstanding performance of Eddie Redmayne. The transformation that is undertaken by the actor to become Stephen Hawking in both body and personality is nothing short of breathtaking. Without the use of any major prosthetics, Redmayne delivers a performance of such astounding and demanding physicality that there is not a single second where the audience’s belief in the characterisation is wavered. There are perhaps a few occasions throughout the narrative where the plot threatens to become a touch stagnant, but this is always rectified by the sheer power and authenticity of Redmayne’s on screen presence. His captivating and enigmatic performance forgives the film a number of its sins, and I would be tempted to wager an early bet on him picking up the coveted Best Actor golden statuette in February. Providing worthy if not entirely equal on screen partnership is relative newcomer Felicity Jones as Jane Wilde. Jones manages to capture and display the poetic, art loving sensibility that so beautifully countered Hawking’s scientific mind, and I found their chemistry to be unconventional but believable nonetheless. A handful of notable supporting roles played by Maxine Peake, David Thewlis and Emily Watson among others, all of whom give fine performances in the limited screen time that they have. Overall, The Theory Of Everything is a solid exploration in to the life of one of the world’s most interesting figures. However, much like biopics including The Iron Lady, Ray and La Vie En Rose, it is the sensational performance by the film’s protagonist that evolves the picture from being standard true story fare to something of particular merit. It is the Eddie Redmayne show from start to finish, and whilst the film as whole may not pull up many trees, the single contribution of its leading man makes it an absolutely must see during this awards season. “it is the sensational performance by the film’s protagonist that evolves the picture from being standard true story fare to something of particular merit.” You nailed it right there. Great post! Hi Amy, saw this on FB and wanted to comment as I am keen to discuss this film with someone. I agree with everything you’ve said, including that they could’ve been more ambitious. I’ve seen the same argument in other reviews and part of me wonders if they were, to a certain extent, erring on the side of caution with depicting Stephen and Jane’s struggles with disability. The film is very sensitive in how it addresses it, but they could have got it wrong and hit the wrong note with less understanding audiences. As it is the balance between all the aspects of themselves is great, as you say. Spot on Tiffany. And as with every biopic made of people still living, there is always a degree of restraint with regards to negative or particularly difficult elements of their lives. Fantastic review, I’m really looking forward to seeing this. Really good review. I saw this last night and think you’ve summed it up really well. I enjoyed the film but agree it’s safe and conventional; in that respect it reminded me of Dallas Buyers Club, which I only just watched, which is also lifted above the norm by the strength of two excellent performances. Redmayne was amazing. I was blown away by his performance. When I dragged to this movie by my mom and brother, I thought it was going to be really boring, but you are right! Redmayne performance is good it keeps you captivated. As a scientists I wish they had focused more on the history of his science life but it is still great to see and learn more about this great man! Awesome review! Makes me want to see it again! The theory of everything is actually a hypothetical theory in physics. Scientists are trying to find the ultimate theory for everything in which all the forces of attraction as well as theories of physics will be connected together. Stephen Hawking is one them who is seeking for such a theory in his whole life. 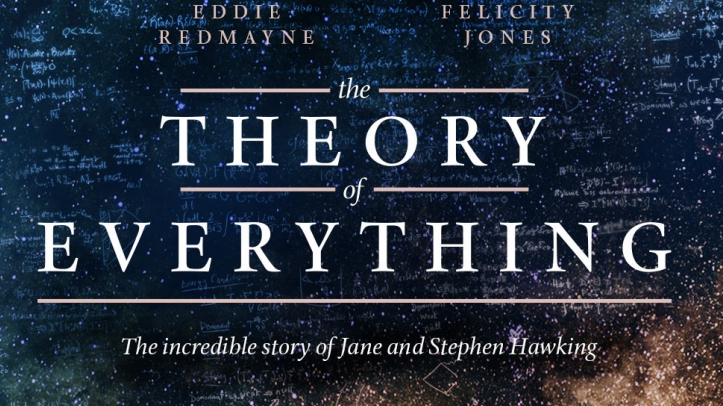 The movie is a romantic biographical presentation of Hawking’s life. It shows us the romantic and emotional part of Hawking’s life, not the part with scientific experiments and thinking. In a word, it’s an awesome movie to enjoy. We all know that theories and movies are different.